For more than 30 years, America has welcomed Pat Sajak and Vanna White into their homes for a chance to play along with the lucky contestants hoping to spin well and win big on Wheel of Fortune. Now, the iconic game show has dedicated an entire week to exclusively spotlight former members of the Armed Forces. 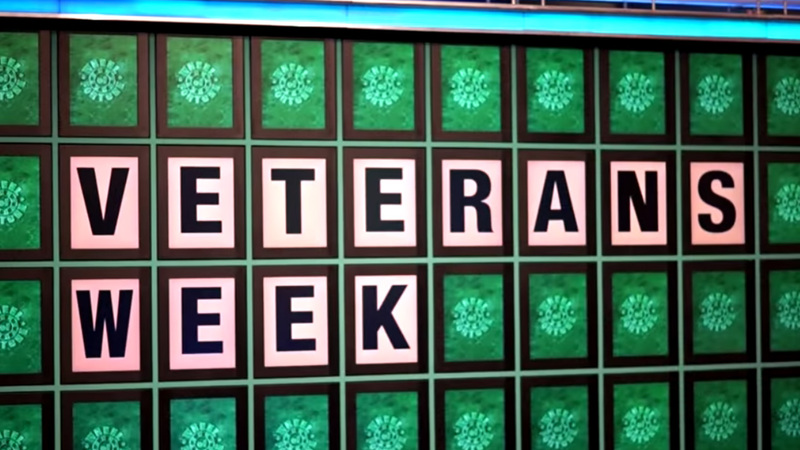 On Monday, Nov. 9, Wheel of Fortune launched its inaugural Veterans Week, coinciding with Veterans Day on Wednesday, Nov. 11. While the show has dedicated episodes to active-duty members of the military and their families, this is the first time it has recognized veterans with their own special week. "But then somebody pointed out there's twenty-three and a half million veterans in the United States," said Wheel of Fortune Executive Producer Harry Friedman. "And so we thought 'what a perfect opportunity to thank them as well for their service.'" The weeklong special hits home with the show's co-hosts. White's father, who recently celebrated his 90th birthday, served in the Korean War, and Sajak himself served during the Vietnam War. Sajak joined the Army in 1968 and spent most of his service as an Armed Forces Radio disc jockey while stationed in Saigon, saying "I was the Good Morning, Vietnam guy." "It certainly gives me great respect for the men and women who are serving now in an atmosphere unlike my time," said Sajak. "They give up a lot of comforts of life, they give up a lot of their security. I have great respect for what they do." White said that Veterans Week has been her favorite of all themed events they've done before on Wheel of Fortune, saying it helped her feel closer to her father. "It makes me feel good, I feel like we're giving back," said White. "It's our way of showing our appreciation. And just what they go through, what they do for our country and for us, you can't repay." Friedman said when they first announced Veterans Week, many commented "it's about time," but that the show took it as a positive way. "I think as we look at what's happening around the world, our appreciation for the men and women who have served in our Armed Forces has become even greater."